The first all-in-one zoom lens to achieve wide-angle-to-long telephoto coverage (28-300mm equivalent) along with outstanding imaging performance, it’s still the world’s lightest, most compact 11.1x zoom lens in its class. Ready for virtually any photographic opportunity – family events, distant wildlife and sports action, compelling close-ups of the kids – it does it all without having to change lenses. Advanced Tamron technology – special XR and LD glass, hybrid aspherics, and internal focusing – is what makes all this possible in a dramatically downsized package. Cutting-edge internal and external multi-coating assures flare-free pictures even under challenging conditions. By incorporating an optical design for exclusive use with digital SLR cameras with smaller-size imagers, this high-power zoom lens provides the same focal length, when converted to a 35mm format, equivalent to Tamron’s 28-300mm. Therefore, you can meet virtually every photographic opportunity with this single zoom lens without changing lenses. When paired with a wideangle zoom, you can thoroughly enjoy digital SLR photography with a combined equivalent focal length coverage of 27-300mm. Peripheral light fall-off is minimised when compared with that of conventional lenses for film cameras so that images are uniformly bright from the centre to the periphery. Since the lens is designed exclusively for digital SLR photography, it provides high image quality in terms of resolution, contrast and flatness of image field. It is important for a multi-purpose zoom lens to be able to get close to small subject. The new optical/mechanical design configuration of this lens allows an MFD (Minimum Focus Distance) of 45cm (17.7″). At 200mm the maximum magnification ratio is 1:3.7*, close-up photography is easy and convenient. * The Maximum Magnification Ratio of this lens is 1:3.7 while the Maximum Magnification Ratio of the AF28-300mm (Model A061) is 1:2.9. However, the 18-200mm can fill the frame with almost the same scope as the A061 does when shooting with a 35mm SLR camera, since the new lens is exclusively designed for digital SLR cameras with smaller-size imagers. The Maximum Magnification Ratio of 1:3.7 is equivalent to 1:2.8 when converted to 35mm film format. New and complex mechanisms are hidden in this lens’ compact construction. Several engineering innovations were required to downsize the design, produce high-precision parts and increase durability, imbuing this multi-purpose zoom lens with excellent portability and ease of use. 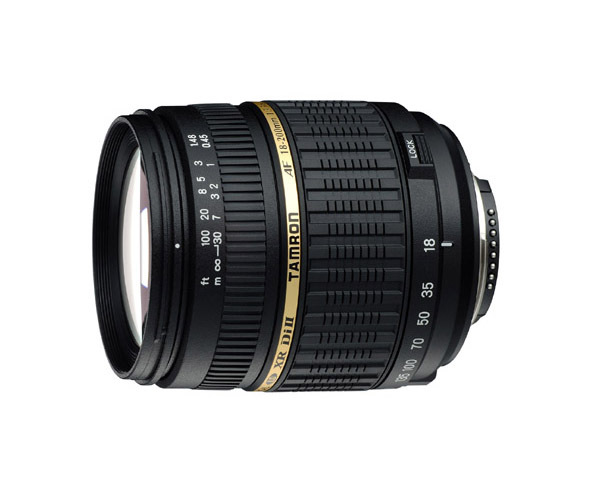 The external appearance has been enhanced with a gold-coloured band between the focus and zoom rings, marking it distinctively as a Tamron Di II lens. New rubber patterns of the zoom and focus control rings complement the digital camera design style and provide improved handling. Tamron has adopted various countermeasures against the problem of ghosting and flare caused by aberrations. Internal surface coatings (i.e., multiple-layer coatings on cemented surfaces of plural elements) and new multiple-layer coating technology on ordinary elements, minimise reflections as light enters through the front element and reduce image-degrading effects caused by the imaging sensors themselves. * Values given are for the Nikon-mount model.